Provides lightness and a silky touch;Stimulates natural hydration;Improves the synthesis of natural collagen and elastin for a smoother and more supple skin. 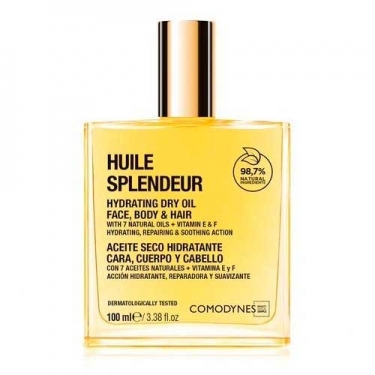 Huile Splendeur Hydrating Dry Oil from Comodynes is a dry golden oil that helps moisturize, lighten, repair and smooth facial, body and hair skin throughout the year. Light texture in dry oil, with a combination of 6 natural vegetable oils (rose, macadamia, argan, olive and avocado), vitamins E and F and nacares lasting, for a nutritive, moisturizing, regenerating, soothing and illuminating action. The skin and hair are extremely soft, radiant and silky.